Milan Cathedral (Italian: Duomo di Milano [ˈdwɔːmo di miˈlaːno]; Lombard: Domm de Milan [ˈdɔm de miˈlã]) is the cathedral church of Milan, Italy. Dedicated to St Mary of the Nativity (Santa Maria Nascente), it is the seat of the Archbishop of Milan, currently Cardinal Angelo Scola. The Gothic cathedral took nearly six centuries to complete. It is the largest church in Italy (the larger St. Peter's Basilica is in the State of Vatican City) and the fifth largest in the world. In 1500 to 1510, under Ludovico Sforza, the octagonal cupola was completed, and decorated in the interior with four series of 15 statues each, portraying saints, prophets, sibyls and other characters of the Bible. The exterior long remained without any decoration, except for the Guglietto dell'Amadeo ("Amadeo's Little Spire"), constructed 1507-1510. This is a Renaissance masterwork which nevertheless harmonized well with the general Gothic appearance of the church. On May 20, 1805, Napoleon Bonaparte, about to be crowned King of Italy, ordered the façade to be finished by Pellicani. In his enthusiasm, he assured that all expenses would fall to the French treasurer, who would reimburse the Fabbrica for the real estate it had to sell. 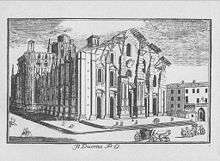 Even though this reimbursement was never paid, it still meant that finally, within only seven years, the Cathedral had its façade completed. Pellicani, largely followed Buzzi's project, adding some neo-Gothic details to the upper windows. 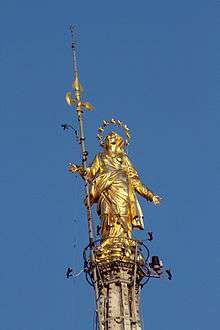 As a form of thanksgiving, a statue of Napoleon was placed at the top of one of the spires. Napoleon was crowned King of Italy at the Duomo. In November 2012 officials announced a campaign to raise funds for the cathedral's preservation by asking patrons to adopt the building's gargoyles. The effects of pollution on the 14th-century building entail regular maintenance, and recent austerity cuts to Italy's culture budget has left less money for upkeep of cultural institutions, including the cathedral. To help make up funds, Duomo management launched a campaign offering its 135 gargoyles up for "adoption." Donors who contribute €100,000 (about $110,505) or more will have their name engraved under one of the grotesque figures perched on the cathedral's rooftop. The figures serve as drainage pipes. Since September 2005, in the cathedral’s crypt, beside the relics of Saint Charles Borromeo, there has been a video installation by English artist Mark Wallinger. Entitled Via Dolorosa, it consists of a 18 minutes film reproducing scenes of the Passion excerpted from the film Jesus of Nazareth by Franco Zeffirelli. yson]] enjoyed the view of the Alps from the Duomo. ↑ See List of largest church buildings in the world; note that the #3 entry, First Family Church building in Kansas, is now a school education complex. ↑ Denison, Simon (June 1995). "News: In Brief". British Archaeology. Council for British Archaeology. Retrieved 30 March 2013. ↑ Ackerman, James (June 1949). ""Ars Sine Scientia Nihil Est" Gothic Theory of Architecture at the Cathedral of Milan". The Art Bulletin. 31 (2): 96. JSTOR 3047224. ↑ Ticozzi, Stefano (1830). Dizionario degli architetti, scultori, pittori, intagliatori in rame ed in pietra, coniatori di medaglie, musaicisti, niellatori, intarsiatori d’ogni etá e d’ogni nazione (Volume 1). Gaetano Schiepatti; Digitized by Googlebooks, January 24, 2007. p. 110. ↑ "Anniversario — 8 settembre 1943: l'Armistizio a Milano (Anniversary — 8 September 1943: the Armistice in Milan)" (in Italian). Archdiocese of Milan. ↑ "Milan's cathedral puts gargoyles up for adoption". CBC News Canada. Retrieved 16 November 2012. ↑ "Milan Cathedral lighting design is executed with ERCO LED spotlights". LEDs Magazine. PennWell Corporation. 9 June 2015. Retrieved 2 October 2015. 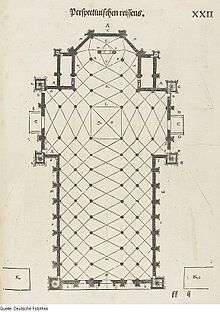 ↑ "Duomo". Frommer's. Retrieved 2009-06-01.